Jews have lived in Richmond since the beginning of the 18th century. The first recorded Synagogue opened in 1916 by the then President of the United Synagogue, Leopold de Rothschild. The Congregation’s first Minister was Rev H. Goodman the first chairman was Arthur Howitt who later became the first Jewish Mayor of Richmond; an honour he enjoyed twice. Rabbi Dr Maurice Ginsburg became minister in 1922, a post he held until 1961! The first Synagogue was in Parkshot; transferring in 1938 to a former chapel in Sheen Road, in the heart of Richmond. The promoter of this move was Hyman Appleby Leon, the only person to be three times Mayor of Richmond and later a Warden of the New West End Synagogue. Initially Richmond Synagogue covered Kingston, but after WWII Kingston Synagogue was founded. After the WWII the Synagogue prospered. There were more than 100 pupils in the Cheder. It had a devoted team of Honorary Officers including such as Samuel Stanton and Cecil Hyams, a Planning Inspector and leading member of AJEX. Lord Woolf, the former Lord Chief Justice, was a prominent member. By the 1980s the Sheen Road Synagogue’s condition had deteriorated and become increasingly uneconomic to maintain. It happened to be in a prominent position in Richmond and adjoined a communal hall, car park and a petrol station; an area Richmond Council wanted to redevelop, leading to protracted negotiations with the local authority which, under compulsory purchase law, had to provide the Synagogue with “equivalent reinstatement”. Negotiations stalled resulting in the involvement of the United Synagogue. 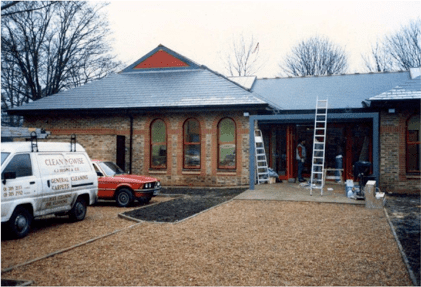 By mid-1981 matters had moved sufficiently far for the London Borough to enquire about the Synagogue’s requirements for temporary accommodation during construction operations. At the beginning of 1982 a car park at the end of Lichfield Gardens was suggested as a site for a temporary building. At one time the site had been occupied by a bungalow owned by a Jewish family, who generously allowed their garden to be used for garden parties by the synagogue. The leading negotiators at this time were Cecil Hyams and Maurice Fireman, a, highly regarded commercial property solicitor and a tough negotiator. Later Michael Clein was to become involved. The Community was fortunate to have so astute a negotiating team. Sadly due to increasing ill health Cecil Hyams’ involvement diminished so that Maurice and Michael became the lead negotiators. As all property of Constituent Synagogues are held by the United Synagogue, the US had to approve any new project; their interest being mainly to ensure projects’ financial viability. Whilst Richard Savinson, as Chairman of the Building Sub-Committee, was deeply involved in the move from Sheen Road all the negotiations with the Council, the United Synagogue and contractors were conducted by Michael with Maurice’s support. The lead Architect was David Stern; a leading synagogue architect who had designed Oxford and Kingsbury Synagogues. His initially proposed a round synagogue, an idea treated with scant enthusiasm by the Board. Various proposals followed, culminating in a fundamentally different plan; for a single storey rectangular building some 617 square metres in size. Of this about two thirds of its length was to be for the Synagogue itself; the remainder being for a communal hall. Initial proposals were for the kitchen to be housed in part of the hall area. Bob Karno, a highly respected Board member, insisted that the kitchen be moved to a space allocated for a classroom, to enable the hall to accommodate 200, seated. The Honorary Officers ensured that the design of the mechitzah had the written approval of the Religious Authorities; a far sighted step in view of opinions subsequently expressed by visiting Rabbonim. 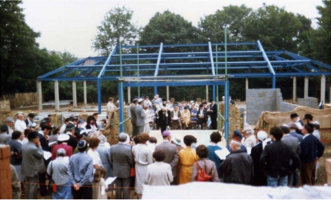 A “ground breaking” ceremony took place on 23th March 1986 at which the first sod was turned by Morry Abrahams, husband of a unique Chairwoman of the Ladies Guild, Stella Abrahams, who insisted that the inscribed spade be placed in a case in the Synagogue’s foyer where it is to this day. 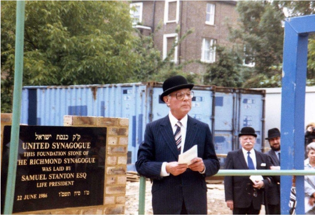 Samuel Stanton, by then Life President of the Synagogue, laid the foundation stone on 27th June 1986 and the building was consecrated by the then Chief Rabbi, Sir Immanuel Jakobovits on 8th March 1987. At the insistence of the Borough Council the old Synagogue had to be vacated whilst the new one was being built. As a temporary home the Synagogue was allocated the Headmaster’s house at the Vineyard School. The lounge was large enough for ordinary services but when it came to the High Holydays it was clearly insufficient. Rosh HaShanah services were instead held in Christ’s School, an excellent venue, save for the necessity to obscure the prominent statue of Jesus. Yom Kippur services were, uneventfully, held in the Richmond Hill Hotel, where congregants tried to overlook the occasional smells of cooking emanating from the kitchen. Samuel Stanton, who ran a furnishing business in Clapham Junction, arranged for transport for the portable Ark, chairs and books. Compensation arrangements with the London Borough only provided for building costs. To provide seating, fitting out the kitchen and the like, we had to raise some £70,000 in addition. Founding donors names are inscribed on an honours board in the foyer rather than having individual plates or items. 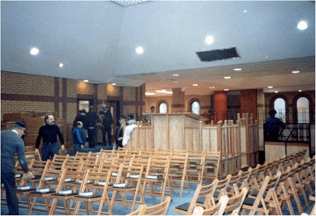 It was decided not to have allocated seats in the Synagogue. The major problem of the 1990s was accommodation for the Rabbi and his family. Successive temporary homes were found entailing renting no less than four different houses! An initial, radical, proposal, was to build a flat over the Synagogue. But this proved too expensive, so a house was built on part of the Synagogue car park. Construction was less of a complication than the funding legacy which engaged successive Financial Representatives to resolve. The Synagogue was most fortunate in having as its last Financial Representative to deal with it, Derek Davis, a retired high ranking civil servant, who dedicated his time, intellect and unremitting patience, into a satisfactory resolution of the issue.